Surprise. I do have a spiritual side. I have spent the past few days on what has turned out to be a Reminiscence Tour of Huron and Bruce counties, visiting longstanding friends and familiar locations from my past. I have camped out for a couple of nights at my brother’s cottage just south of Kincardine and on the wall in the living room is a painting that was done by my late mother sometime in the 1960s. This morning when I looked at the painting, I decided to go there, to sit on that beach and see if that rock was still in the water. For years, our family had a cottage at the top of the hill in the community known as Bluewater Beach. I spent many summers there from about age 5 on. My kids also remember Grandma and Grampa’s cottage well. I picked up a coffee in Goderich and a Danish at Culbert’s bakery. I parked at the top of he hill across the street from where Vasiloff’s had their cottage and walked along the road past Hartman’s and Haskett’s and Footwinkler’s and Halpin’s. None of those people are there – most of them are dead. The buildings, most of them drastically changed are there but with different owners they feel empty and foreign. 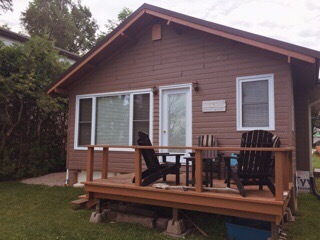 No one was home at the cottage that used to belong to my family – we had called it Tip Toe Inn –so I went out onto the front yard, sat down and had my coffee there looking out over Lake Huron. The cottage was built by my Dad starting in 1952. The structure remains the same although it is now brown, not white with red trim. I then took the well-worn path and steps down to the beach. At the bottom of the hill I could see the rocks in my mom’s painting. It’s true, she did take some artistic license with the size and perspective but the rocks are still there with waves crashing over them just as in the painting. While I was on the beach, I met a fellow who was wandering along with his dog. He had a beard and long hair pulled back with an elastic. I know he would not call it a man-bun. He said he had a place at the top of the hill that sounded like it was where Art Johnson, the local woodsman, used to live fifty years ago. He said he spent a lot of his time wandering the beach and kayaking, – a bit like a Robinson Crusoe. He has built a little hideaway up against the cliff under some trees. His kayak was there, some places to sit and a painting of a whales tail in the water. We talked at some length about the beach, the way the lake changes from year to year but also the way that certain things stay the same. I told him about Benny Daer, the local bootlegger, and Miss Salkeld’s blue cottage tea room. I may have bored him but he listened politely. For me it was a flood of memories. This year the water level in Lake Huron is high. Everyone thinks this is an anomaly. But I remember this beach in many years past exactly as it is today. We would have to clear rocks away to make a sandy spot to put our beach towels. Some years there was sand in the water and some years there was not. Some years the shore was polluted with seaweed, other years it was clean. Some years we would have to walk a couple of kilometers along the beach to Black’s Point to have a good swimming. Along the way we would stop at “the big rock”, another large flat table-like rock 100 m from shore. My new-found friend assured me he knows that rock well. And yet another “big” rock –in the picture below– at the base of the stairway to the beach was sometimes almost out of the water. But I also remember it exactly as it is now. When I was 10 we would go out to that rock and jump off of it into the water. All the rocks seemed bigger then. As I stood there, I reflected how the rocks in my Mom’s painting will be there 100 years or 200 years from now as well. But I won’t. There is something both comforting and disturbing about that thought. How small and temporary we are in the grand scheme of things. I’m not religious but sometimes I do have a spiritual side. These rocks are as close to God that I can get. They are steadfast, immovable, reliable and enduring. And there is something reassuring about knowing that, although we are only on this planet for a very short time, there is something greater that lasts… and lasts…and lasts. Addendum: As I stood taking the photo above, looking toward Goderich, beyond the point in the distance, it reminded me of the time when my “cousins”, my 7 year old brother and I decided on the spur of the moment to walk along the beach to Goderich, maybe 5 km away. We neglected to tell our parents and, needless to say it took us longer than we anticipated. It was before the days of mobile phones or even a phone at the cottage. Our parents were frantic and at 4 pm found us walking along the highway in an attempt to head home. Brother Bob was exhausted. Parents were relieved to find us safely but were pretty angry with us. As a kid, this just seemed like a reasonable adventure. As a parent and grandparent I can understand our parents’ panic. 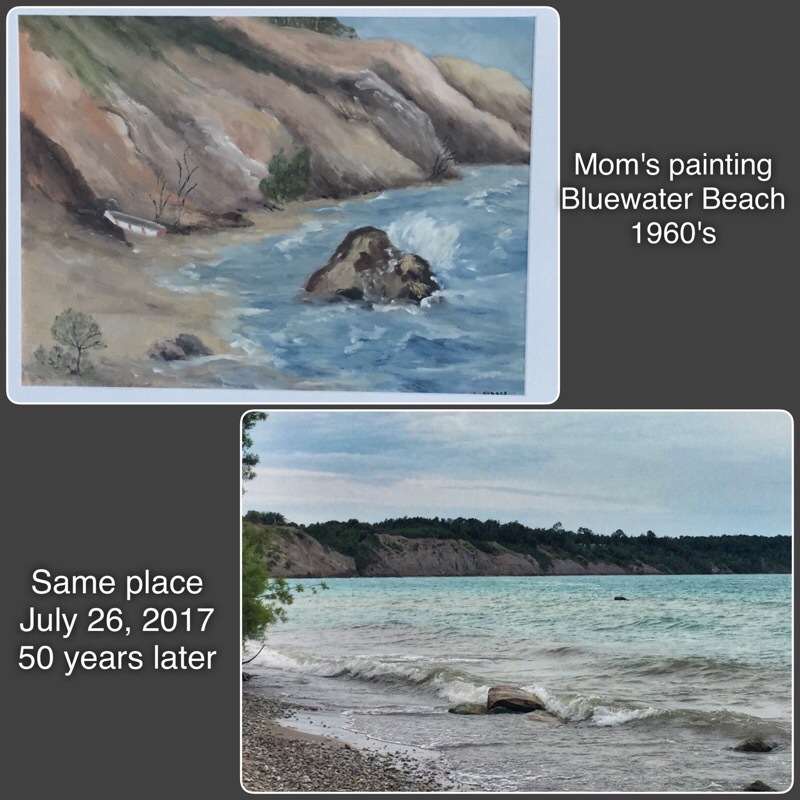 This entry was posted in Uncategorized and tagged Bluewater Beach, childhood, Goderich, memories, Ontario, rocks, spiritual by johnageddes. Bookmark the permalink. Thanks for the BWB update. Lots of good memories there. Some day I will follow your footsteps. Thinking of you today, too, Bob. In another remarkable coincidence I was talking to the caretaker of the Auburn Bslls Methodist Cemetery, trying to find my great great grandparents there and in our conversation he said a couple of years ago he bought a cottage at BWB. Turns out it was the Richardson cottage near the park. We will have to chat about the changes to the places there. Some astounding. I enjoyed that. Makes me feel privileged to carry on with building cottage memories, a little further north.